The quickest, most cost-effective and reliable method to ensure positive identification of blood bags available on the market today on rolls and A4 print sheets. 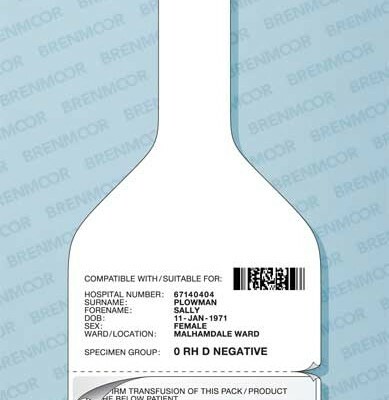 Designed, produced and supplied exclusively by BRENMOOR, our innovative, fully patented, blood bag tags fully comply with all aspects of the MHRA (Medicines and Healthcare products Regulatory Agency) Regulations. 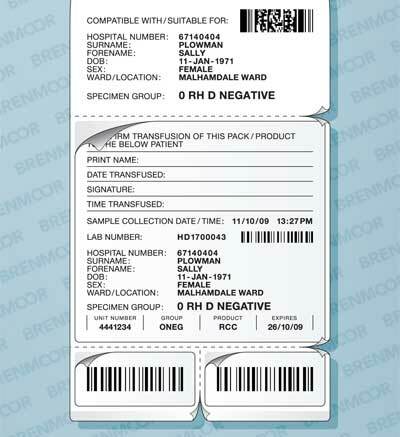 The blood bag tag is supplied blank and can be printed through all common direct thermal printers and attached to the blood bag in a matter of seconds. Once printed the blood tag is completely resistant to water, soaps, alcohol and all common chemicals used in blood banks, hospital wards, theatres and laboratories, to reduce the likelihood of blood being wrongly administered. The face of the blood bag tag contains a selection of printable areas, to record both the patients and transfusion staff details, and also will allow a handwritten signature to be added. Additionally, there are a number of perforated areas which are easily detached and used for accurate recording of the transfusion process on to patient notes. The blood bag tags on rolls have been designed for use in the vast majority of commonly used, direct thermal transfer printers including Zebra’s 2844 & G-Series ranges, as well as most TEC, Citizen, TSC, Maxatech, Intermec, Brother and Avery models. As with all other BRENMOOR products, they are designed to accept GS1 standard barcode formats. Numerous designs available offering different sizes of removable sections and labels. We can also design a tag specifically for an individual hospital if required. 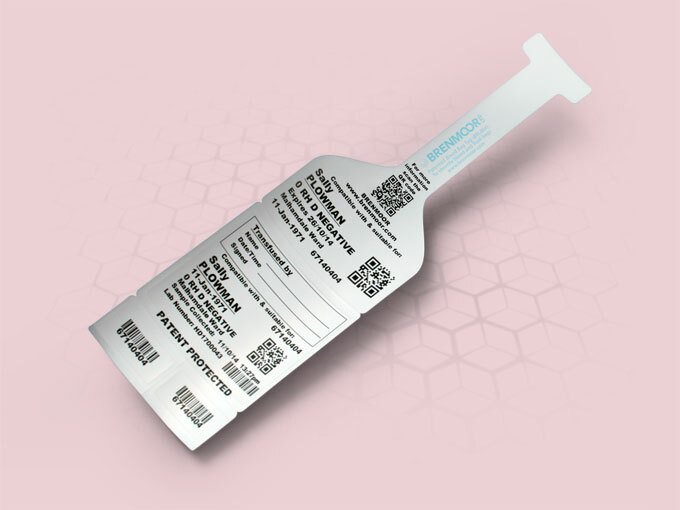 Our innovative blood bag tags can be printed using common direct thermal transfer printers including Zebra, Citizen, TSC, Intermec, TEC, Brother & Avery. We carry stocks of our popular range of blood bag tags allowing us to fulfil over 90% of customer orders within 24 hours. A selection of videos of the BRENMOOR range of patient identification products are available to view below. A selection of images of the Innovative MHRA compliant blood bag tag labels are available to view and download below. To save any files, right-click on “Download” below the required image and select “Save Image As”, “Save Link As” or “Save Picture As” dependent upon your choice of Internet Browser. Additional images of this product, including high resolution print versions, are available for download by Partners or Press from our password-protected area – once logged-in they will display below. To save any files, right-click the file name and select “Download Linked File”, “Save File As” or “Save Link As” dependent upon your choice of Internet Browser. Please call for a password on 0845 807 1090 or by email using our Contact us page. Reducing and, where possible, eliminating errors is central to improving patient safety. Often these errors will result in little or no harm but can be distressing for patients and staff, although some result in serious, lasting harm, such as chronic pain, undiagnosed cancers, blindness and even death. Below are a selection of guidance notes from the former NPSA programme of work on safer patient ID – matching patients correctly with samples, specimens, records and treatment. Flowcharts showing the steps to take to help ensure correct and safe identification of babies and mothers at antenatal and post-natal stages. This summarises research on manual checking and the use of technologies for patient identification. Patient Safety Alert on ways to minimise the risk of surgery on the wrong part of the body. Safer Practice Notice on ensuring acute hospital inpatients wear wristbands. Safer Practice Notice recommending both high and low-tech solutions to making blood sampling and transfusions safer. Safer Practice Notice recommending standardisation of wristband design, patient identifiers, colour coding, printing and processes for producing, applying and checking wristbands. 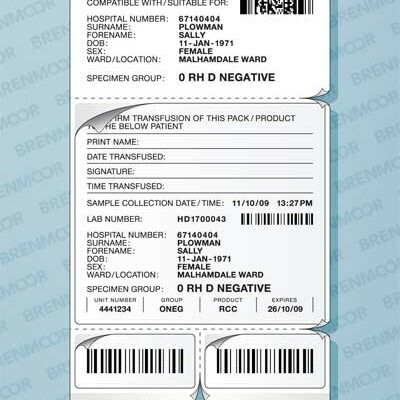 Slide the divider to the left or right of the image to see how the Blood Bag Tag can be printed and separated for use.